This is a secret (ssh!) show, but you can tune in here. The transition from competitor to colleague is often a very quick and smooth one in the dulcimer world. I first met Mark as a competitor at Winfield this is certain true in our case. We have worked together at several festivals and I am in awe of his performance, his teaching and tickle by his sense of humor! Mark is a freelance musician based out of North-Eastern Ohio. An orchestral trumpeter by trade, Mark has a doctorate in Trumpet Performance from The Ohio State University and has played in a dozen orchestras in the US and in Europe. Mark is also a National Hammered Dulcimer champion (1998) and performs all over the world on hammered dulcimer, mountain dulcimer, trumpet, piano, guitar, and penny whistles. Join DulcimerCrossing.com to have access to all of the lessons all the time, so you can play like Mark! DulcimerCrossing is excited to announce and brand new Hammered Dulcimer Lesson set in time for the Holidays! God Rest Ye Merry, Gentlemen is a popular, minor mode English carol from the late 1800’s. Here, Steve demonstrates 5 different locations and keys in which to play this carol, also demonstrating the Rhythmic Displacement that he used when recording this tune on his 2003 CD ‘Twas in the Moon of Wintertime. You can listen to the tune here. It has also been added to the lesson set and the Backing Track Library for Premium Members. This lesson series will go live in time for Christmas. You can subscribe to have access to all of the lessons, all of the time! At DulcimerCrossing.com, we love being able to present all kinds of dulcimer performances for our Members. We finished last month with a concert by 2013 National Hammered Dulcimer Champion Katie Mortiz and her guitar side-kick Skip Siddick. Here is the Highlight Video she chose and we are excited to share it with you. Premium Members have access to Live Events like this every month. Basic Members have access to these Live Events every quarter. Want to join us, too? As Katie demonstrates, this is a LOT of fun! Matthew Dickerson, our newest Hammered Dulcimer instructor at DulcimerCrossing.com, will be LIVE on Monday, June 4th on Concert Window for a free concert for Subscribers (Join Now!). 8 pm EDT; 7 pm CDT; 6 pm MDT; 5 pm PDT. We are pleased to welcome 2012 National Hammered Dulcimer Champion, Matthew Dickerson, to our roster of instructors at DulcimerCrossing. Matthew joins our faculty of 15 respected and gifted instructors of mountain and hammered dulcimer and fiddle. We are filming and editing his lessons and they will be available for all subscribers on dulcimercrossing.com. Subscribe and you’ll have unlimited access to all of his lessons, and those of all of our instructors! When something seems unbalanced and out of rhythm, just a song can tune things up in a moment. The power of music is therapy. Tuning a hammered dulcimer for the first time can be pretty intimidating. The first couple times you tune your dulcimer it may take quite a while, and you’ll think it was very difficult task. But, with practice, you will get the hang of it and soon you won’t even think twice about tuning. I use a chromatic electronic tuner to make the job easier, and Steve and I recommend the Snark™ Dulci-Tuner. With these senior eyes, I find the display to be very readable, and it slips right over the hammered dulcimer tuning pin. You can read more about the tuner in Steve’s blog here. 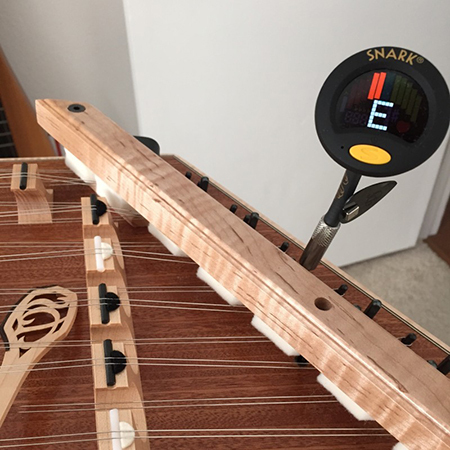 You can order the Snark™ Dulci-Tuner from Steve by clicking on this link. In the Absolute Beginners section at Dulcimer Crossing, our lesson called String-Side UP addresses many of the questions and issues you may have with tuning your hammered dulcimer. Video #17 covers the mechanics of tuning. Video #18 includes 4 tips to help with tuning, and addresses issues if you are experiencing difficulty trying to get both sides of your bridges in tune. 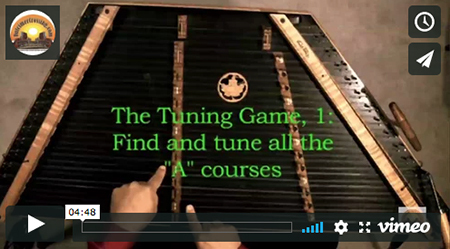 In addition, we offer The Tuning Game on our FREE page, to motivate you to practice your tuning more often. The thing to be careful of is when you are tuning a string is to make sure you are turning the the right tuning pin. If the needle on the electronic tuner is not moving, STOP! You are on the wrong string, and may turn too far and break it. Some people ask if they need to tune their hammered dulcimer EVERY time they practice. I find when my dulcimer is in perfect tuning, I play better and practice longer. If I only have about 15 minutes to practice, I usually skip the tuning. But when I’m going to have a serious session of working out a new tune, I tune first and then warm up. Here’s some tuning guidelines you might want to keep in mind. Give your dulcimer a thorough tuning at least once a week – don’t ever let it get way out of tune. Always carry your tuning wrench and electronic tuner in your dulcimer case. Turn the tuning pin SLOWLY, while softly plucking continuously. Give your instrument a final checkup by matching the tones of your octaves at each bridge marker. As always, if you have any questions, please feel free to ask Steve or myself. 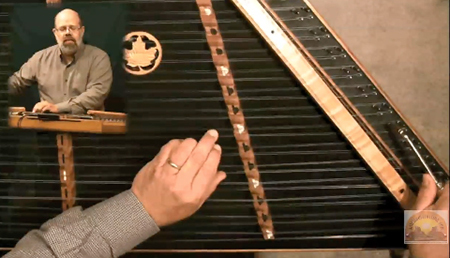 Steve Eulberg has created a new lesson for this delightful old-time waltz, the Peekaboo Waltz to be played on the hammered dulcimer. This lesson features two different ways to play chord back up (such as Steve plays in his duo Fiddle Whamdiddle with Vi Wickam) as well as a fancier solo version. Subscribe to DulcimerCrossing.com to have access to the whole lesson set!